My night was incredibly eventful. Not in a dance until dawn kind of way (unfortunately) but in a let’s see how many times Full Speed can wake up Mommy and Daddy kind of way. Turns out, he can do so a lot. He’s been attending basketball camp this week and it isn’t exactly going his way. This is his first experience with the sport and to put it politely, it may not be something that comes naturally to him. Who cares? I certainly don’t. I’m glad he has this opportunity to try something new and he’s only six for heaven’s sake. He’s not meant to be Michael Jordan. He’s meant to be active have fun. Since he’s not having 100% fun he’s had a series of mysterious stomach ailments, supposed overwhelming fatigue and monsters in his room that disrupt everyone’s sleep. 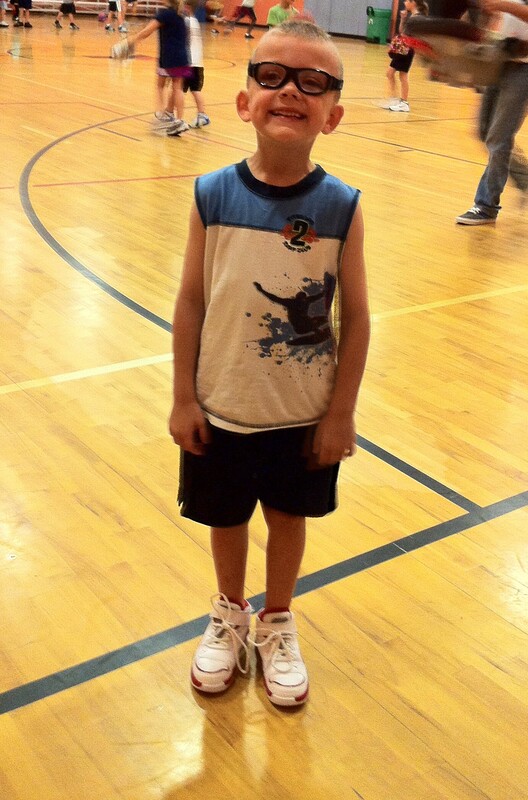 It’s a good thing he looks so adorable in his Air Jordan’s otherwise this kid might earn a Mommy-technical foul. And, blissfully, there’s only one more day of camp. This smile seems genuine. Maybe he's starting to actually enjoy himself?